This stitch pattern reminds me of the the tiny fly-away seeds on the flowers in my front yard. It looks impressive but is surprisingly simple to execute (the leg is really just a fancy rib). The curvy lines of the main motif are echoed in the curves of the gusset and in the arch shaping, and all those curvy lines make your feet look awesome. 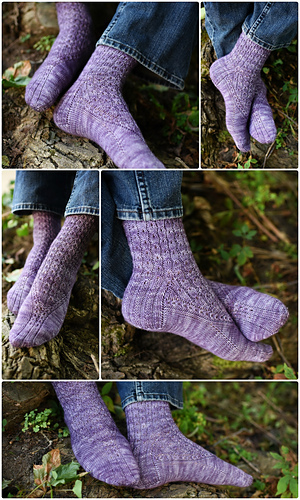 The pattern comes in three sizes (56, 64, and 72 stitch cast on) to fit most anyone. And of course you should feel free to adjust your gauge a bit to fine tune the fit of the sock. Just be sure that you’re working at a gauge that gives you a sturdy sock fabric with your chosen yarn. I recommend working at something around 7, 8, or 9 stitches per inch, and I’ve included a table to help you figure out what gauge you’ll want to use for the size you need.